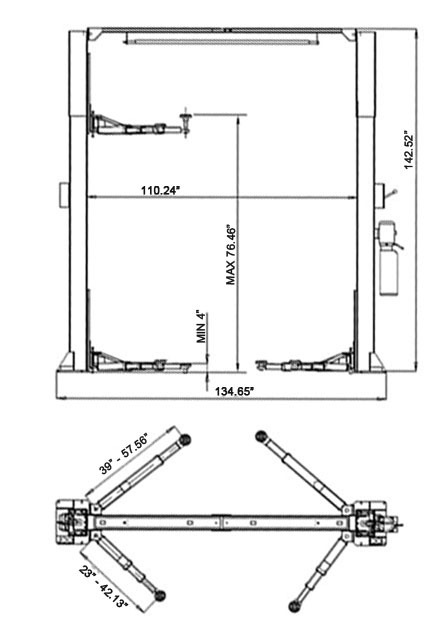 Max Lifting Height w/Adapters 76.46"
This item is warranted for five (5) years on structural components and one (1) year on air or electric hydraulic power units, pneumatic power units, and major components from date of invoice. Wear items are covered by 6 months. Hydraulic cylinder is covered for 2-year warranty. This LIMITED warranty policy does not include a labor warranty. This warranty applies to the ORIGINAL purchaser only, and is non-transferable. The warranty covers the products to be free of defects in material and workmanship but, does not cover normal maintenance or adjustments, damage or malfunction caused by: improper handling, installation, abuse, misuse, negligence, carelessness of operation or normal wear and tear. In addition, this warranty does not cover equipment when repairs or alterations have been made or attempted to the Manufacturer’s products. THIS WARRANTY IS EXCLUSIVE AND IS LIEU OF ALL OTHER WARRANTIES EXPRESSED OR IMPLIED INCLUDING ANY IMPLIED WARRANTY OR MERCHANTABILITY OR ANY IMPLIED WARRANTY OF FITNESS FROM A PARTICULAR PURPOSE, AND ALL SUCH IMPLIED WARRANTIES ARE EXPRESSLY EXCLUDED. THE REMEDIES DESCRIBED ARE EXCLUSIVE AND IN NO EVENT SHALL THE MANUFACTURER, NOR ANY SALES AGENT OR OTHER COMPANY AFFILIATED WITH IT OR THEM, BE LIABLE FOR SPECIAL CONSEQUENTIAL OR INCIDENTAL DAMAGES FOR THE BREACH OF OR DELAY IN PERFORMANCE OF THIS WARRANTY. THIS INCLUDES, BUT IS NOT LIMITED TO, LOSS OF PROFIT, RENTAL OR SUBSTITUTE EQUIPMENT OR OTHER COMMERCIAL LOSS. DUE TO THE COMPETITIVENESS OF THE SELLING PRICE OF THESE LIFTS, THIS WARRANTY POLICY WILL BE STRICTLY ADMINISTERED AND ADHERED TO. Screw style adjustable pads with stack adapters 1 ½" and 4"
Overall lifting height with stack adapter 75 ¼"